The latest DfE Keeping Children Safe in Education guidance reflects the growing range of issues and risks that affect young people in England. What we do in school when something concerning comes to our attention may not change that much, yet the range of issues that we need to be aware of as professionals is definitely growing. With these challenges intensified within SEN establishments, here at Safeguarding Essentials, we want to ensure that budgets do not restrict access to invaluable resources that will help deliver safeguarding across the whole school. While the resources, policies, guidance and teacher training have been developed predominantly for mainstream schools, many of our members represent SEN schools across the UK and they find that the resources can be easily adapted for their specific needs. 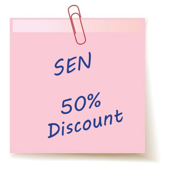 Please note, by using the discount code provided, you are confirming that you qualify as an SEN categorised establishment. All orders will be validated - any schools using a code which they do not qualify for may be invoiced at full membership price.